Editor's note: A new study by scientists in the United States, China, France and Germany estimates that the world's oceans have absorbed much more excess heat from human-induced climate change than researchers had estimated up to now. 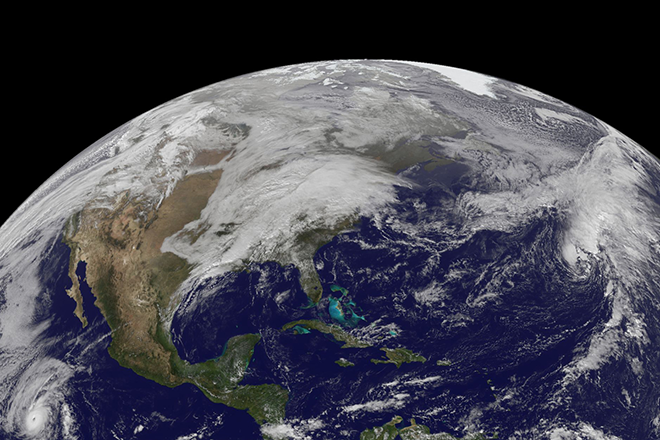 This finding suggests that global warming may be even more advanced than previously thought. Atmospheric scientist Scott Denning explains how the new report arrived at this result and what it implies about the pace of climate change. They use thermometers attached to thousands of bobbing robots floating at controlled depths throughout the oceans. This system of "Argo floats" was launched in the year 2000 and there are now about 4,000 of the floating instruments. The implication of faster ocean warming is that the effect of carbon dioxide on global warming is greater than we'd thought. We already knew that adding CO2 to the air was warming the world very rapidly. And the IPCC just warned in a special report that limiting global warming to 1.5 degrees Celsius (2.7 degrees Fahrenheit) above pre-industrial levels - a target that would avert many extreme impacts on humans and ecosystems - would require quickly reducing and eventually eliminating coal, oil and gas from the world energy supply. This study doesn't change any of that, but it means we will need to eliminate fossil fuels even faster. They have measured tiny changes since 1991 in the concentrations of a few gases in the air - oxygen, nitrogen and carbon dioxide - with incredibly high precision. This is really hard to do, because the changes are extremely small compared to the large amounts already in the air. Some of these gases from the air dissolve into the oceans. The water's temperature dictates how much it can absorb. As water warms, the amount of a gas that can dissolve in it decreases - that's why a soda or beer left open on the kitchen table goes flat. That same temperature dependence allowed the scientists to calculate total changes in global ocean heat content from 1991 to now, just using very precise measurements of the air itself. This study did not address climate impacts, but they are already well known. As the world warms, more water vapor evaporates from both oceans and land. This means that when big storms develop, there's more water vapor in the air for them to "work with," which will produce more extreme rain and snow and resulting winds. This study very cleverly used data from the composition of the air itself going back nearly 30 years. We didn't have Argo floats back then, but air samples are still available that can be analyzed decades later. Using a longer record of warming is much better for estimating the rate, because it's less sensitive to year-to-year variations than a shorter record.